The Animas Corporation is a leading supplier of insulin pumps. These products are designed for individuals that must take insulin for their diabetes. A person can use these devices to control and maintain their insulin intake with a few easy to follow steps. The Animas IR-1250 insulin pump has several benefits and features that will allow an individual to obtain insulin without much effort. This type of product is still on the market today with glowing responses. An individual can acquire this machine and begin using it right away. The Animas IR-1250 comes with simple to understand instructions that can assist anyone with setting up their machine quickly. 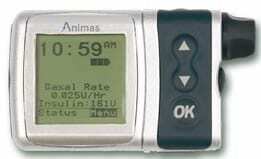 In 2005, the Animas Corporation publicly announced that the IR-1250 model of insulin pumps had a bug in the programming. It was brought to their attention because of a complaint from a consumer. They stated that the meter was not functioning properly. The corporation then discovered that other problems were occurring, such as the alarm functions. They volunteered a recall of these items in the best interest of their patients. Nevertheless, no adverse or harmful effects were ever reported. A couple of months later, the Animas Corporation fixed the bug and replaced all of the defected machines. This machine is small and light weight for added convenience. The batteries for this device can be a lithium or alkaline. An Animas IR-1250 insulin pump is energy efficient. These batteries can last for up to 8 weeks at a time. An individual will be able to set up several programs with the basal rates as well as the bolus rates. These are determined by the individual’s personal needs. A medical professional will assist in this matter. Various types of alarms can be found on the Animas IR-1250 device. These can include low insulin, over medicated and low battery alarms. They are user configured and can be set to vibrate. However, it is suggested that a person does not set this to vibrate during sleep. Several calculators are present within the device. A person will be able to count carbs, set up an on-the-go meal plan and correct bolus rates. This is a fantastic feature that assists a person to plan ahead as well as remember their food intake. The display screen is large enough to read with poor eyesight as well as less scrolling. The benefits of the Animas IR-1250 are plentiful. There are several options that a person can use to customize their insulin pump to their personal tastes. The device is waterproof for up to 24 hours. An individual will be able to swim or shower without any worries about harming the pump. An individual will be able to change the appearance of the machine. It comes in several styles and colors for a person’s unique tastes. The Animas Corporation has a 24 hour a day helpline. These trained medical professionals can assist in any questions or concerns one may have about the product. There is a download and upload service that a person can use to obtain different alarm sounds, keep personal information, program basal options and store the pump settings. This is a fantastic method in keeping important information secure as well as more customizable options for an individual’s personal style.